Old hippies and festival culture kids from across America have showed their support of the Lakota nation and the protesting of the Dakota Access pipeline for months. 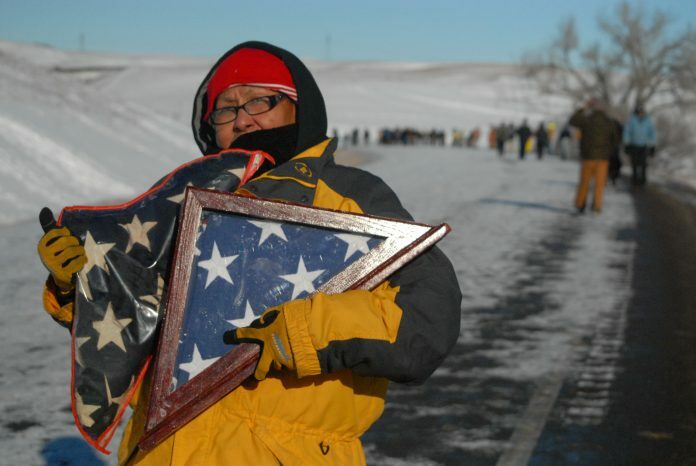 Now, veterans have said that more than 10,000 of their rank are happy to build barracks and support the Oceti Sakowin camps with those who protested the wars they served in. Roger Hintson, 47, served in the marines from 1992-2001, with tours to Kuwait and Bosnia. He said it’s an odd but good thing to have veterans and the hippies working together because they have different skills. Morton County put out a “Know the Truth” video about a confrontation with veterans earlier this weekend, which characterized the veterans defending Standing Rock as un-American. Hintson said he’s proud to serve the natives side by side with the hippies who protested wars. Hintson said he came to Standing Rock because Trump got elected. Veteran Richard Crell said he voted for Donald Trump because his daughter is in the military and said Hillary Clinton disregards the safety of American soldiers. Crell’s friend, who identified himself just as Grzywa, said he’s a libertarian and served in special operations through the 1990s because his country called on him. He quit his good paying job and returned to service after 9/11. 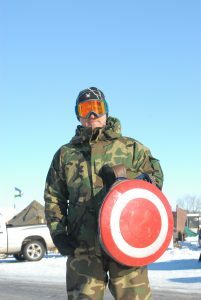 Grzywa said it wouldn’t make him feel uncomfortable to be in a confrontation with law enforcement though he served with and knows several men who now work for Tiger Swan, the private security group for DAPL. Grzywa said he’s disappointed with how law enforcement have acted in North Dakota, but knows that’s not a representation of the law enforcement community at large. U.S. Army veteran David McGrath, 51, was “proud and happy to serve” as part of Reagan’s Army from 1985-1996. McGrath was happy to help build barracks before the blizzard hit Monday, because “coming together and creating a village will greatly help their cause,” he said. He reconciles serving in the military during oil wars with helping protesters now. “When we were young, we joined the military out of idealism. I understand that Gulf Wars I and II were resource wars for oil. I understand that. But our duty once we’ve signed up is to serve, to serve honorably and to be there to protect our brothers and sisters in arms,” he said. He said Morton County officers have a similar duty, to protect people from violence and enforce the law. McGrath said he doesn’t believe Gulf War protesters were against his time in the military and sees hippies as brothers in arms fighting for the same messages. He said he’s always supported protesters, especially those against the wars he is still happy he served in. Gabe Sheoships, 35, is a member of the Cayuse Tribe in northeastern Oregon. He’s been at the camp two days, coming out with a small group of firefighters to help the veterans build barracks and bring supplies for the natives. 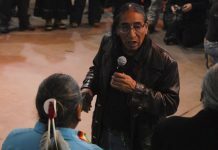 Sheoships said that, as a native, he feels honored to have the veterans and hippies working together. Eric Sabo, a veteran from Claycomb, New Jersey, said the response to the veteran’s presence, including from hippie protesters, has been rewarding. Vincent Shumaker served in the navy from 1968-1969. 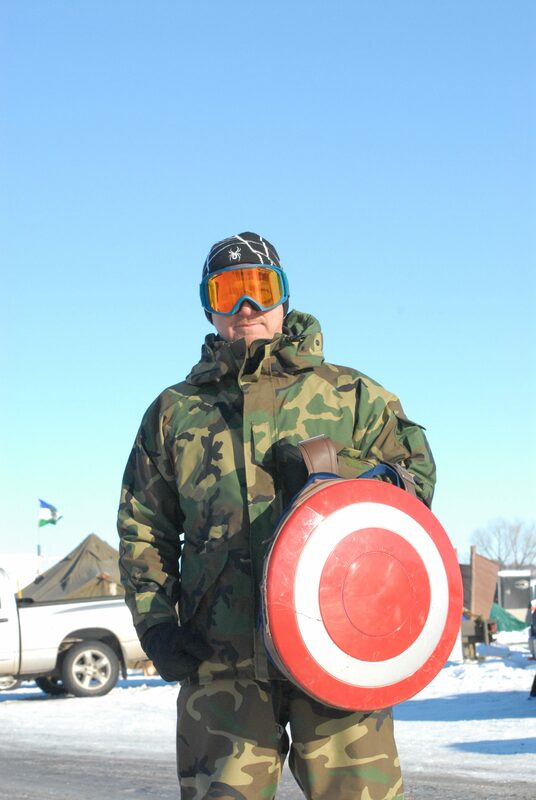 He’s from Grand Rapids, Mich.
Air Force veteran Micah Danning, 34, from Arlington, Va., said he headed to Standing Rock after seeing how Morton County Sheriff’s Department has treated protesters. A native woman carried two U.S. flags up to the Backwater Bridge as veterans marched up to the bridge for a ceremony. Cotton Wood said her brother fought in Vietnam, but she’s just as thrilled to have hippies who protested the Vietnam War at camp too. “Everyone that fights for peace and stands up for the rights of Native Americans has my gratitude,” she said. Ret. Navy Lt. David Givers, who served in 1963-67, said it’s important to stand with the people of Standing Rock in the battle for their future and keeping the water clean. James Ryan, a marine veteran who served in Vietnam, said he “always felt guilty” for not joining the Vietnam Vets against Foreign Wars march on Washington when he arrived back from Vietnam. He went to work for a community radio station in Wisconsin that was owned by native tribe. He said it was disgusting to see how these peaceful protesters have been treated by militant officers, and was grateful for hippie groups who arrived before the veterans did to support indigenous peoples.